bx92Miyzm9HEFkaEhYzly8BCg8g ~Mommy's Moments~: Sunsational Summer Giveaway Hop ~ Join in! Sunsational Summer Giveaway Hop ~ Join in! 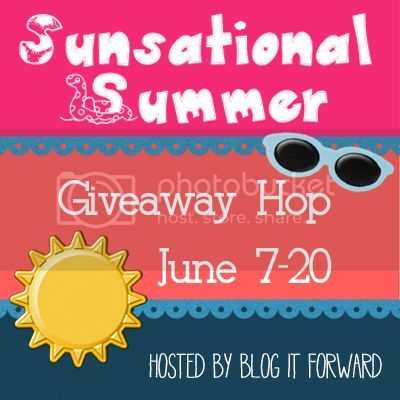 Sunsational Summer is a Giveaway Hop being hosted by My Mommy’s World, Taking Time for Mommy, And The Little Ones Too and Put A Little Umbrella In Your Drink! It runs from June 7-20. This is much like our previous hops but we’ve changed a couple rules. You still only need a package worth $25 or more to do the hop. Either create a blog post telling other bloggers about this event OR pay a $5 administration fee to clarinet0921(at)live(dot)com as a gift. If you don’t want to send it as a gift just add 50 cents. So there is NO FEE to sign up as long as you create a blog post about the event. Do not delete the blog post. Have your post LIVE by midnight Eastern Time on June 7. If the post is not live by 10 am EST on June 7, you will be taken off of the “linky”. The Event will run until 11:59 pm EST on June 20, the first day of summer! Send a request to join the Facebook group “Blog It Forward”. It will keep you up to date with everything Sunsational Summer related. You will receive the link after you regsiter. Please Turn OFF Captcha or Word Verification during the entire duration of Sunsational Summer. You cannot combine your prize with the prize for another event. REMEMBER: This event is limited to 150 blogs so enter as early as you can.